Last Monday I made my boys different meatball dishes. I just mixed a kilo of ground pork (use your hands!) with pepper, salt, garlic powder, minced onion, chopped carrots and egg. 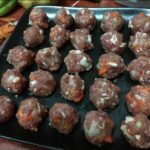 Shaped them into balls, prepared my ingredients, and cooked sweet and sour meatballs for the boys’ lunch. 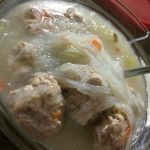 Some, I made into meatball soup with sayote and sotanghon for breakfast. 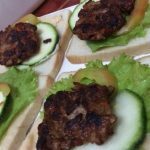 There were a few meatballs left which I flattened and made into burger patty for the boys’ merienda at school. With this tactic, I not only saved time but also earned my Big Bunso’s praises because he was so amazed at the fact that one could do so many from just one idea. It was just the first day of school and I hope to be able to continue this eagerness to wake up early and prepare for my boys. OMG I remembered my elementary days xD My lunch before was always fried meatballs hahaha the meatball soup with sayote looks really yummy! Haha. It’s because it’s so easy to prepare. Hahaha. The meatball soup is one of my boys’ fave. Hahahhaa. We also save some for our lumpia. Hahha. Funny story. Hurray for the stepmom who taught you those tricks. Ihihi. Hahhaa. Hurray to us busy moms and our own meatball stories. Hihi. I used to bring baon too at work. Yup, meatballs is love. Oh, so meatballs are not just for sweet & sour! When we were maid-less, I was so stressed in the kitchen. Preparing the ingredients, cooking, washing. And then repeat for dinner. But versatile dishes like your meatball would have kept me sane, haha! PS: Thank you for the wonderful words you left on my blog. You are welcome. And yes, meatball are so easy to prepare and the kids wouldnt even notice that the food serves to them are just the same, iba iba lang pagkakaluto. Ehehe. Meatballs are always a life-saver! They are very easy to prepare, and they’re yummy too. 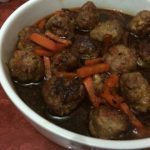 My favourite meatball recipe is almondigas! Please share the almondigas. First time to hear about that. Yup, meatballs are so easy to prepare– indeed a life saver. Meatball pag punta namin sa bahay nyo sis! hahahaha. Let’s set the date already. See on on Sat na naman sis! Muah! haha. Yup, Saturday. Let’s talk din on Sat to set the day. And yes, meatballs for breakfast, lunch and dinner. Hahaha. I couldnt agree more. Hahaha. Here’s to more meatballs! OO, nakakaaliw. When I was making my draft nga. I asked myself a number of times bakit ko pa to ipopost? kaso naaaliw talaga ako kaya I want to share.. Ihihi. Great idea momi Berlin! !I shoud try meatballs in sotanghon. Mukhang masarap yung meatballs with sotanghon. Our kids are not into schools pa, so for our baon sa office palaging yung madadaling lutuin lang.